Over the course of the first half of the 1900s, a radical change in the manner in which the alewives were harvested from the Nemasket River, occurred. Originally, the work of capturing the fish was done by men with hand nets who would scoop the fish out and load them into waiting wagons or, more typically, wooden barrels of 200 pounds capacity. As late as the early 1930s this was still the process followed as recollected by Ralph Maddigan, Jr., who in 1947 recalled “the old time fishing place in a stream [behind the Star Mill], which had a box where the fish gathered and … were hand netted out.” Maddigan’s cousin, James F. Maddigan, Jr., who resided on the farm above the Star Mill privilege, also recalled the process. As far back as I can remember, the fish were scooped up in large hand nets and deposited in barrels set in a large box, perhaps 8 feet by 10 feet in area; any that missed the barrels in their loading could then be recovered and re-barreled. From here they were either hauled away, or moved to the herring house for processing. Before the fish were packed into barrels, the men seining the river sorted the fish and anything other than alewives and shad – perch, pickerel, eels, lamprey, bass, trout and turtles – were tossed back into the river. The development of power-operated seines during this period would however drastically alter the process. These seines were simply lowered into the river and then emptied. At the time, trucks replaced barrels as a means of transporting the fish with the herring dumped loose into the back of the trucks. “When the seine is pulled the fish are brought out in a huge net, elevated by engine power, and dumped into trucks, which are then weighed, and in that manner the number of barrels per truck is established. They are hurried away in these huge trucks, principally to canneries to be processed as food.” The number of barrels was calculated by considering each 200 pounds as a barrel, the former standard of measurement. To accommodate the seines and the equipment necessary to power them, a small pier or platform was constructed at the Star Mill site. Typical was the procedure outlined below which described the process during the 1940s and 1950s. For years after the fish have entered the pool, a net has been set, with a rope rigging so that it can be gathered in and all the fish brought together at the base of the loading platform [at the edge of the river]. A hoist, powered by a stationary engine, has lifted the fish into waiting trucks to get them on their way to processing. The fishermen would set their net across the river, below the dam, and leave it overnight. The next day they would wade into the stream and begin drawing in the net towards the small dock, on which was a winch, powered by an automobile engine. A small purse net, suspended from a boom, was dipped into the river net, to be hoisted full of fish. It was swung, either over barrels or a truck, and the catch released by pulling a rope at the bottom of the purse net. During the 1954 harvest, a novel means of taking the fish was employed by the Cundy Harbor Fisheries of Maine. While the fish were still netted and the ends of the net gathered together, a suction hose was inserted into the net and the fish removed through means of the hose. A water pump and 25 horse power engine were installed at a cost of $3,500. The engine was “mounted in a truck, and the electrical gadgets and controls which operate it are in the truck. The truck has a temporary foundation of cement blocks.” In order to power the machinery, Cundy paid the an additional $250 to the Town of Middleborough for the Electric Light Department to run an electrical line to the loading platform. The fishing pool has a net spread, and workers in a boat service it. The lines of the net are then pulled taut and the net brought toward shore with the top floating on huge cork floats. Then the suction hose is lowered into it …. When the motor starts … it picks up the water and the fish from the river and they pass through an eight-inch rubber hose, which elevate[s] them about 15 feet, and the water and fish drop into a large box. There a worker can grasp the trout, perch and pickerel and an occasional bass, which make their way along the stream with the herring. Efforts are made to hand pick all but the herring from the box. They are released down a sluice-way to a waiting truck. The other kinds of fish are restored to the water, apparently none the worse for their trip through the siphoned water which brings them up. While the process seemed to save a step in the process, it failed to work as expected. The suction machine mangled many of the fish, in the process destroying any value they may have had except for fertilizer. Despite the facility with which the herring could now be captured, the new methods had a number of drawbacks, foremost of which was that time was no longer taken to sort the fish drawn up in the net. In the past, the fishermen had returned all fish other than herring to the river, but with the new means of operating, time was no longer taken to sort the fish and all species went into the truck, a habit which tended to deplete the stock of all fish in the river. Secondly, the means of transporting the fish, particularly in the early days of motor transport, could also prove problematic. In 1939, the tailboard of a truck transporting the fish broke open, strewing the roadway with dead herring. “Passing autos skidded on them, and highway employees had to report at night to push them off the road and to sand it to make it safe for traffic.” A similar mishap occurred the following year when herring fell out of a hole in a truck, and were deposited along North Main and Center Streets before the situation was noticed. Autos proceeded to squash them. Some store keepers, figuring they might become fragrant, went out with boxes and picked the ones up in front of their store, while some more folks seeing a chance to get fresh herring without much effort picked them up and took them home. No doubt those last folks were old-time Yankees. Alewife Harvest, Star Mill Privilege, Middleborough, MA, photograph by George Morse, 1910. Local amateur photographer George Morse captured this scene during the herring run in spring 1910. While a young boy watches, two men take the fish by hand by means of a large scoop net. The herring are then packed in barrels and large boxes. The house in the background faces East Main Street. Alewife Harvest, Star Mill Privilege, Middleborough, MA, photograph, mid-20th century. 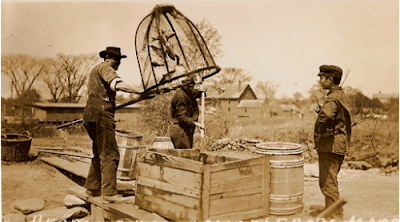 This photograph indicates the changes which occured in the practice of alewife harvesting during the first half of the 20th century. No longer conducted by hand, the harvest relied upon teams of men and nets drawn across the course of the river. 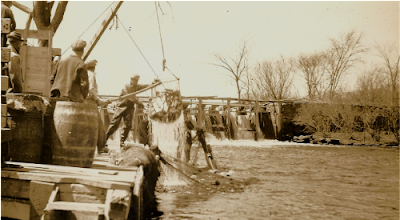 Large mechanically-operated scoop nets would then draw the fish from the river, depositing them in barrels or open-top trucks for transportation to canneries or processing plants most often in Maine. The Star Mill dam (the wooden portion of which was removed in 1956) is visible in the background. Brockton Enterprise, March 10, 1947, “Middleboro. Herring Bid is Rejected”; April 5, 1948, "Herring Start Running and First Catches Start Today"; March 19, 1954, "New Plan for Loading Fish"; March 27, 1954, "New Device to 'Reap' Herring"; March 29, 1954, "Herring Run Starts Sunday"; April 26, 1954, "Herring Run Over"; March 7, 1955, "Herring Rights Sold"
Great timing for this story.